Looking for a delicious meal packed with veggies and that’s easy to eat? Try these delicious quinoa patties that are travel friendly and keep well in the fridge as leftovers that can easily be reheated for lunch. We’ve included shallots, carrots, and zucchini in these vegan, dairy-free and gluten-free patties that are similar to veggie burgers, but you could use onion, garlic, other root veggies like sweet potato or beets, and other leafy greens like chard or kale. Because these patties are baked, it makes this recipe so much easier to prepare than frying them on the stove top. The magic ingredient that is the base of these patties and works to hold everything together is quinoa. Soaking quinoa in a bowl of water overnight or during the day before you prepare this recipe will make the quinoa softer, more sticky and better at holding the other ingredients together in the shape of burgers. Besides this, soaking quinoa is an important step to make it easier on the digestive system as well as make its nutrients more accessible to the body. Grains, nuts and seeds contain phytic acid, which binds to the minerals in these foods, making it difficult for the body to access these nutrients. But, soaking grains, nuts and seeds helps to reduce the the phytic acid content. Quinoa is an excellent source of protein, fiber, and many minerals including manganese, magnesium, zinc and potassium. It’s fiber content is as much as 10-16 grams per 100 grams, which helps support removal of waste through your digestive system as well as prevent your blood sugar from spiking. And, it’s protein content is 8 grams per cup and contains all nine of the essential amino acids. The essential amino acids are normally only found in animal based foods, so quinoa is quite a special plant based food that vegetarians can get protein from. 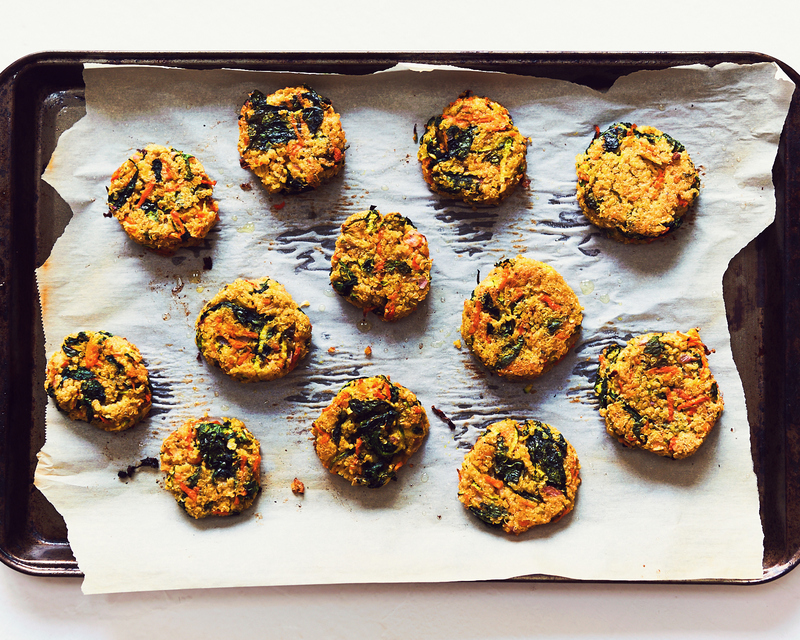 We hope you’ll give these quinoa patties a try. Let us know if you do and snap a photo and tag us on Instagram or Facebook, we’d love to see how they turn out! We recommend soaking the quinoa in a bowl of water overnight or during the day before you make this recipe. Then drain the quinoa and toss out the water. Place the quinoa, water, and olive oil in a large sauce pot and bring it to a boil. Lower to a simmer and cook the quinoa, covered, stirring occasionally for 20 minutes, until tender and all the liquid is absorbed. Let the quinoa cool to room temperature (you can place it in the fridge to speed this process up). Place the cooked quinoa into a large bowl with the shallots, carrots, zucchini, spinach, flour, baking powder, yogurt, tahini, salt, pepper, cilantro, and lemon juice. Lightly oil the paper with avocado oil. Using a ¼ cup to measure, place the scooped mixture on the paper and press down lightly to form patties. Bake for about 20 minutes or until lightly browned (10 minutes on each side).